For the past 15 years, the engineering and architectural consulting firm RS&H has had the same kind of people on its small 401(k) committee: folks who were in their late 40s, 50s, or even closer to retirement. However, this year there is a new face at the meetings: committee member Tim Page, who is 34 and has worked at the company for about a year. The hope is that Page can bring ideas to the table that appeal to millennials just starting out in their careers. RS&H started making many changes within its Jacksonville, Florida, location that would increase the job satisfaction, productivity, and engagement of its many millennial employees. It surveyed workers to understand their needs and then tore down walls that divided colleagues into sections where people wanted more collaboration and teamwork. It created smart conference rooms that recognize employees’ laptops when they walk inside and automatically sign them in to the company’s information technology systems. It created a new, extra-high-deductible medical insurance option that allowed young, healthy employees to reduce their monthly payroll deductions. Bottaro reports employees now work at hydraulic work centers and sit/stand desks and can buy into a group auto insurance plan, among other offerings. The company added more target date retirement funds and auto enrollment at the company match level, in addition to the Roth option. RS&H set up more technology-based education surrounding the options. These changes have resulted in a participation rate of more than 90 percent in RS&H’s retirement plans. “The ability to let people have greater choice, whether it’s in their physical work environment or their investment options or how they even choose to invest … has been very well received,” Bottaro says. The millennial generation sure catches a lot of flak, especially when it comes to their work habits and financial situations. Their negative reputation precedes them in some employers’ estimations. But understanding the forces that have shaped millennials’ professional and financial decisions—and what can be done to respond to them—can help employers make the most of the largest component of today’s workforce, and create greater loyalty and engagement. “Millennials aren’t coming in at a time when they have fully funded health care, defined benefit pensions, and guaranteed annual increases,” says Liz Davidson, founder and chief executive officer of financial coaching company Financial Finesse. “The way the world used to work, the benefits structure was much more designed to foster that loyalty.” Now, it’s up to employers find new, creative ways to do so. Millennials are loosely defined as the generation born between 1980 and 2001, and they are projected to comprise a full 75 percent of the workforce by 2025. They are often maligned for lacking work ethic, being self-centered, and needing constant validation. However, this generation comes to their cubicles with a wealth of positive traits as well. The promise of millennials lies in some of the very characteristics that have earned them the brush-off from older professionals. Their expectations about getting validation and feedback translates into plenty of opportunities for coaching and correction. Their desire for flexibility in the workplace means companies that deliver it can reap the rewards of their efficiency. And it’s not all bad news when it comes to millennial employees and their finances. A good number of them are impressive savers  for both retirement and emergencies, shaped by the Great Recession and formative years spent in economic uncertainty. Millennials seem to be using credit cards less  than people of a similar age did in the past, and they are more mindful about credit card debt and mortgages. They do better than some previous generations with budgeting and managing money, according to Davidson, who thinks they are more financially savvy than they get credit for. Millennials are “tech-savvy multi-taskers” who are “the best team players and collaborators in generations,” according to a University of North Carolina report. They tend to be optimistic, educated, and achievement-oriented. And they are eager to keep progressing both personally and professionally. That drive to keep moving upward can sometimes translate into moving onward: On average, millennials tend to stay at a job just two years. However, by investing in their millennial workers’ well-being, employers can help them get on a more solid financial footing—and show them that working for their company is more than just a job. It begins with demonstrating that your organization’s leadership is truly invested in their well-being, from professional satisfaction to financial wellness. And a big part of that is recognizing the financial issues many millennials face. The recession hit everyone hard, but millennials were especially affected. Many were victims of the “last one in, first one out” policies some companies used to tap people for layoffs as the economy turned downward. Others who were just joining the workforce around the time of the recession were forced to take lower-wage jobs or do more student loan borrowing than they might have had the economy been performing better. Compared with previous generations, millennial incomes tend to be lower and are likely to be stagnant . Research shows that millennials are still earning as much as 20 percent less, in real terms, than both baby boomers and Gen Xers did at the same age. The picture is just as disappointing for those millennials who racked up debt. And that’s a lot of them. A survey of 5,500 millennials by PwC showed that 54 percent worry about their ability to pay back their student loan debt, and 80 percent of college-educated millennials carry at least one source of outstanding long-term debt. “The greatest struggle from their point of view is student loan debt,” says Davidson, something she says is subjectively true. “But the greater struggle underlying may be how they’re planning for their future and how they’re managing their finances on a day-to-day basis.” Case in point: Many millennials make unwise financial decisions, like paying off their student loans while paying exorbitant credit card interest each month. There’s an “emotional attachment to feeling like you need to pay it off or else feel like that investment in college wasn’t worth it,” Davidson says. Despite their financial situations, too many millennial employees lack the knowledge they would need to start chipping away at those damaging levels of debt or curbing unhealthy spending habits. In fact, the PwC survey found that only a quarter of them have basic financial knowledge, and a measly 8 percent demonstrated “high financial literacy.” Despite that deficiency, most of them do not seek professional help with their finances. Instead, they sacrifice their retirement accounts, use alternative financial services such as payday loans and tax refund advances, and overdraw on their checking accounts. All of this adds up to financial fragility . A worrisome 65 percent of millennials say they are making “not enough” or “just enough” money to keep up with their expenses. Forget about emergency funds, savings, or extras. “Their biggest hurdle is really that they have a lot of demands on their money,” says Phyllis Klein, Senior Director of CAPTRUST’s Consulting Solutions Group. For those millennials with the option, many rely on their parents for financial support, creating ripple effects for the finances of other generations in the process. Notably, for the first time in 130 years, the Pew Research Center found in 2014 that millennials were more likely to be living with their parents  than on their own or with a partner. Though changes in marriage practices were the main cause of the shift, Pew found that employment and wage trends and the Great Recession were partly to blame as well. Without an actual financial safety net, living at home becomes a way of trying to save money and achieve otherwise out-of-reach stability. And while many in this country used to assume they’d end up better off than their parents, that version of the American dream is fading : A comprehensive look at intergenerational mobility found that millennials are far less likely to earn more than their parents did. All this adds up to an incredible level of financial stress  for millennials, who feel it more acutely than any other generation. That’s stress that takes a toll, not only on millennial employees, but also on the organizations, they work for. And it’s one reason employers may find it important to take a leading role in boosting their millennial workers’ financial health and wellness. That support can come in any number of forms, from generationally minded financial wellness programs to workplace environments designed with millennials’ work preferences in mind. Savvy employers are offering financial coaching and advice, immediate eligibility for retirement savings plans, and a healthy match to engage millennial employees. “If you look at the value they place on retirement plans in general when making job decisions, it’s strikingly high,” says Matheson. “They’re going to value things like you matching money toward retirement and providing tools to help them maneuver through their debt.” Offerings like help budgeting for education, wellness programs focused on consolidating debt, easy payroll savings, and automatic emergency funds are all options. Millennial workers tend to hold on to a definition of success that their older colleagues may have abandoned, placing more value on meaningful work, job satisfaction, and personal growth than on stability and a big paycheck. “That’s a positive and should be incorporated into how companies address the marketplace for hiring and retaining talent,” says Matheson. He suggests creating more-collaborative environments that flatten organizational charts and enable team-based environments, carving out opportunities for younger employees to work on side projects they are excited about, and finding ways to provide real-time and continuous feedback. Adding fringe financial benefits such as gym memberships or outside expert financial counseling shows millennial employees you are willing to invest in them, and that they should do the same. Smart employers should also be turning to crowdsourcing, according to Davidson: “having millennials themselves help build the financial wellness programs that will ultimately be rolled out to them.” Make these programs more of a campaign, with stories and social media components instead of something more stagnant, like a lunch and learn, or hands-off, like an app, she suggests. At RS&H, Bottaro reports positive feedback has led the company to expand the changes to more offices: Charlotte, Dallas, and Denver, with more to come. And they’re continuing to encourage participation from millennials, who want a say in how the company rewards their hard work. His firm is in good company. 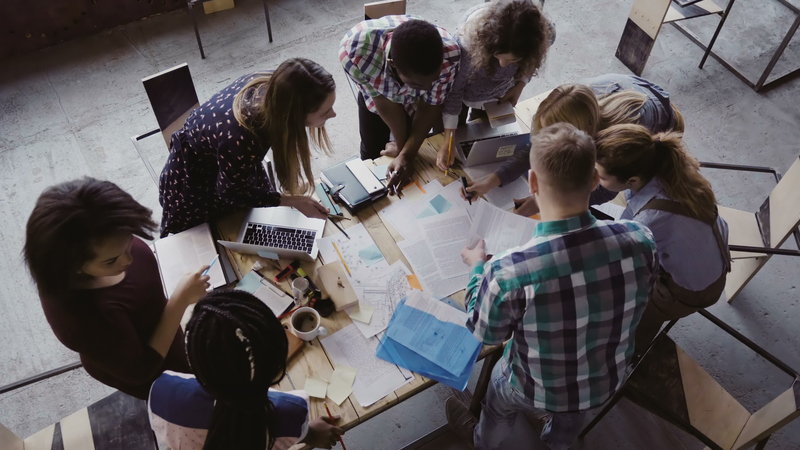 GE and Google are among the many businesses who have created successful initiatives by soliciting ideas and participation from millennial employees. The lesson for other employers who want to increase loyalty and engagement among millennials is clear: If you want to know how to best involve and motivate millennial workers, just ask them. Bankrate.com. Millennials Increase their Savings but Financial Security Slips, Donna Fuscaldo, March 28, 2016. The New York Times. How Millennials Became Spooked by Credit Cards, Nathaniel Popper, Aug 14, 2016. Economic Innovation Group. The Millennial Economy, Accessed Sept 20, 2017. PEW Research Center. For First Time in Modern Era, Living With Parents Edges Out Other Living Arrangements for 18- to 34-Year Olds, Richard Fry, May 24, 2016. Stanford News. Today's Children Face Tough Prospects of Being Better Off Than Their Parents, Stanford Researchers Find, May Wong, December 8, 2016. Huffington Post Blog. Financial Stress Surging Among Millennials, Kent E. Allison, April 27, 2016. Jennifer Brookland is a freelance journalist living in Durham, North Carolina. She has written from eight countries and currently produces a public radio show for WUNC. Jennifer has a Master of Science in journalism from Columbia University.